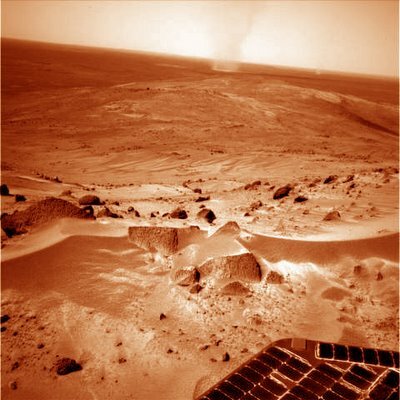 The plucky NASA Mars Rovers have long outlived their projected lifetimes of 90 days by more than eight times the engineer’s warranty. One of the reasons for that is what the engineers are calling “wind effects”. In other words, the wind on Mars has unexpectedly dusted off the rover’s solar panels and allowed them to soak up more energy form the sun longer than anyone ever dreamed. The atmospheric pressure is tenuously low. It is around 10 mb – which is around 1/100th that as sea level on earth - at best. Compare that to Mt. Everest where the atmospheric pressure is at 300 mb. But there is enough complexity even at that low pressure and a surprising thermal activity that generates not just a few dust devils but hundreds per day within small regions – such as those clearly visible to our rovers. I have developed a movie page where I have set up the seven best NASA released mini-movies of the dust devils as photographed from the rovers themselves on Mars. In my Book – Abyss of Elysium – there is a detailed discussion of these events in a fictional setting and how these winds could possibly affect future Mars explorers. Be sure and click on this link to take a tour of the QuantumLimits.com Mars Dust Devil Movie Page!